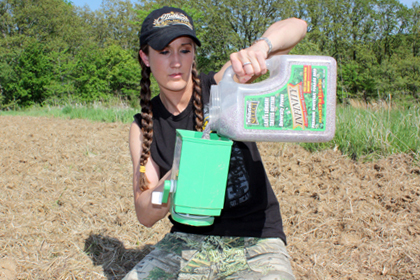 One key factor to growing and keeping big bucks on your property is food plots. I like hunting over them early season, late season, and even on the edges during the rut. One big misconception is that you need big expensive equipment to get your food plots planted. Of course this is nice, but there is always a cheaper option, your own two feet. You can work with a nearby farmer to disk up your field or use an ATV to get things started. Once it comes to planting you can buy a simple hand spreader and do it by hand. I decided to plant a clover blend on a small one-acre plot I have situated about 50-yards from the timber. This is an area where deer naturally travel from one wood lot to another, so a food plot should make for even better hunting. Once the deer start coming to the field on a regular basis throughout the summer I will have my Cuddeback's up and watching for any big boys that may be hitting the area. This works out well because it gives me an idea of not only what size bucks are hitting my food plots, but when and where. Prior to opening day I like to sit in a gun box or tree stand off in the distance and watch how the deer enter and exit the field. This usually gives me my best chance for taking a big buck on opening day. Just because the does and fawns filter out on one particular part of the field, doesn't mean the bucks will come on the same path.